Apple announces iPhone 7, accidentally tweets details early! Apple held their annual Press Event on Wednesday (September 7) in New York City, where they announced the iPhone 7. The new iPhone is expected to have a better battery life, be water resistant, have a new and improved camera (with optical image stabilization, larger aperture and 60% faster), stereo speakers, and much more! There will also be additions and changes to the messenger app and the maps app, among others. The manufacturer also boasts a new and improved home button, which has a Taptic Engine and will be more responsive. There will also be no headphone jack, which had been rumored for months. Wireless AirPods earbuds will be sold, and you'll be able to use your old headphones that will plug into the charger. The phone will come in five colors: two types of black, gold, silver and rose gold. Apple also announced that a new Nintendo Mario game will be available in the app store called Super Mario Run - a side-scrolling, automatic-running game. Dressed in a high cut black body which reveals a little too much of her curvy derriere Serena Williams struts into shot in a pair of thigh-high laced up boots. The tennis star gets her game face on as we meet her female opponent in an equally racy outfit consisting of an embellished low cut black body, fishnet tights and high-heels. As the camera flicks between bottom and breast shots this could easily be mistaken for the latest raunchy music video but in actual fact the sequence of an advert - for a tennis game. The 60 second commercial was made to promote Top Spin 4, a tennis game made for Wii, but the game's maker 2K Sports rejected it because it was too raunchy. The opening sequence which introduces Serena as 'the world's sexiest tennis player' and her opponent 'the world's sexiest gamer' includes shots of the woman's bodies in their tight and highly revealing outfits. And things get no better when the game is underway. Grunting, perspiration and lots of body shots shown in slow-motion are interspersed with clips from the actual video game. On Monday actress Rileah Vanderbilt, Serena's opponent in the raunchy advert, tweeted a link to the video. But the video never came. The games maker 2K Sports released a statement and said: 'As part of the process for creating marketing campaigns to support our titles, we pursue a variety of creative avenues. This video is not part of the title's final marketing campaign and its distribution was unauthorized,' The NY Daily News reported. Store up to 2,000 photos or 90mn of video with top-notch Class 6 speed. Works just like with your regular SDHC memory card. Perfect for your compact camera! Upload JPEG photos & videos fast through your home Wi-Fi network thanks to built-in 802.11n speed. Get the only card that can free-up space for you after pictures are safely delivered. Never worry about running out of space again. Wirelessly upload JPEG photos and videos to folders of your choice on your computer, or even directly into iPhoto for Macs. Organized. Photos and videos can automatically land in date-based folders, so memories are organized effortlessly. No need to buy a new camera. Check here to confirm that your camera can be turned into a wireless uploading machine. You can select which photos and videos are uploaded. Get notified. Get email, Facebook or Twitter alerts when your photos are uploading online. Optimism is back in style in the automotive world. 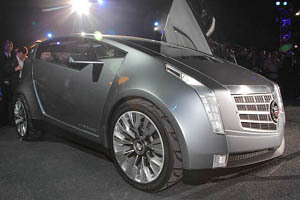 The concept cars on display during the 2010 LA Auto Show prove that automakers are again willing to take risks and push boundaries. After a couple dismal years of sales due to a global recession, manufacturers are exhibiting a renewed sense of creativity. Some of the concept cars seen in Los Angeles rely on heritage to spark a new ideas for the 21st century. The aggressive-looking Audi Quattro Concept is a modern interpretation of the German company's famous all-wheel-drive sport coupes from the 1980s. Other automakers chose to break all the rules and display cars that look ready to take flight or travel through time. The Jaguar C-X75 and Mercedes-Benz Biome concepts are not only wildly futuristic, they're absolutely gorgeous, and a sign of even more good things to come. Mercedes-Benz Biome This is the Mercedes-Benz you'll aspire to own in, say, 2310. The bright white concept looks like it belongs on the set of Star Trek. Yet the Biome was actually designed at the German company's design studio in Carlsbad, California. There's room for four-passengers inside, or so we're told, and the seating position is in a diamond format. 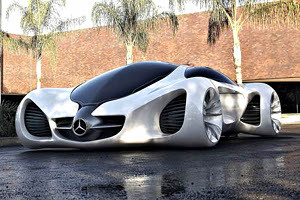 The best part is that Mercedes-Benz says the Biome can be grown from seeds, and not built in a traditional factory. It sounds crazy, but that's part of the fun with any dream car. Using genetically modified trees and powered by something called BioNectar4534, Mercedes-Benz says the Biome's bio-fiber cloth body would be grown organically, and on the road, the car would emit pure oxygen. The Biome reportedly would weigh only 875 lbs. It will be several generations before anyone starts pondering the spec sheet for a genetically-built Mercedes like the Biome. Jaguar C-X75 Concept Following its impressive Paris debut, the Jaguar C-X75 turbine-electric hybrid supercar took center stage at the LA Auto Show. 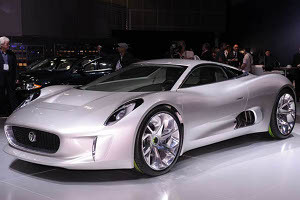 While very much a concept, the C-X75 represents Jaguar's new design face for upcoming models. That's excellent news, because this is one pretty kitty. Even better is the fact that all this beauty is more than skin deep. At each wheel is an electric motor that weighs 100 pounds and provides 195 horsepower (145 kW) of power. Power for the electric motors comes from a 506-pound lithium-ion battery pack, which Jaguar claims takes a full charge in just 6 hours at 240 volts. Running only on electric power, the C-X75 will provide a driving range of 68 miles. With the help of two micro gas turbines, the C-X75's range jumps to 560 miles. Jaguar claims the C-X75 can accelerate from zero to 62 mph in 3.4 seconds, while top speed is reportedly 205 mph. All that turbine-generated power creates a lot of heat, as evidenced by sign at the exhaust outlets with the warning: Beware of blast. The Audi Quattro Concept is another Paris Auto Show veteran, but that did little to dampen enthusiasm for this muscular show car. The inspiration for this sport coupe stretches back a few decades. The German automaker built the Quattro Concept to celebrate 30 years of its Quattro all-wheel drive system and the Quattro Sport that dominated rallying in the 1980s. 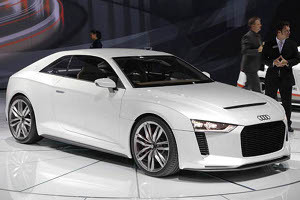 Finished in Col de Turini white paint, the Quattro Concept is powered by a compact turbocharged five-cylinder engine that puts out a whopping 408 hp and 354 ft-lbs of torque. The chassis beneath the car comes from an Audi RS 5, with its wheelbase shortened and roof lowered. To further trim weight, the two-passenger Quattro has an aluminum body and hood, plus hatch and bumpers made of carbon fiber. The car weighs just 2,866 lbs. Based on the positive reactions to the Jaguar C-X75 in Paris and Los Angeles, we don't see how Audi could decide not to build the potent Quattro. 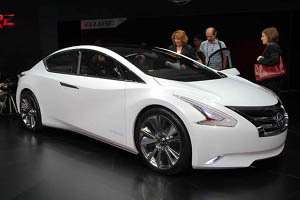 The Nissan Ellure Concept, a world debut at the LA Auto Show, is meant to bring excitement back to the sedan category while meeting consumer demands for environmentally friendly vehicles. Thankfully, the Ellure's elegant exterior and classy cabin help the car meet these high expectations. The design is expected to heavily influence the next Altima and Maxima sedan. The Nissan Ellure has what the Japanese automaker refers to as "rhythmic" shapes around the body. The polished grille is aluminum and acrylic, its wing shape apparently inspired by "Kamishimo," the Samurai's formal outer coat. The headlights are LEDs, with a light ribbon adding depth to their appearance. Inside, the front seats are covered with black recyclable suede fibers and feature slender acrylic seat backs. The front seat passenger can make use of an ottoman (no joke). Under the hood is Nissan's next-generation hybrid propulsion system: a supercharged 2.5-liter inline-four-cylinder engine mated to an electric motor with lithium-ion batteries. Also seen for the first time in Los Angeles, Cadillac's Urban Luxury Concept addresses the move to smaller and more fuel-efficient city cars. The exterior shape of the Urban Luxury Concept carries Cadillac's strong and instantly recognizable sharp contours of its Art & Science design philosophy. The huge 19-inch wheels are pushed to the corners of the diminutive body to create a muscular stance and maximize interior volume. A large windshield, overhead skylights and see-through A-pillars aid visibility while adding a spacious feel of the interior. The Cadillac Concept accommodates four passengers, with access to the cabin handled by huge chiseled door slabs that open scissor-style. The Urban Luxury Concept's powertrain is a hybrid, featuring an electrically assisted turbocharged 1-liter inline-three-cylinder paired to a dual-clutch transmission. An engine start-stop function and regenerative braking help nudge the fuel economy to a claimed 56 mpg city and 65 mpg on the highway. It remains to be seen whether the Cadillac family tree has room for a vehicle like the ULC. Yet itís exciting to see the American brand combine traditional luxury with the push towards greater fuel-efficiency. 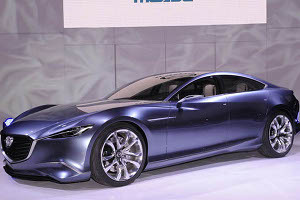 The LA Auto Show was the first opportunity for the public to see the handsome Mazda Shinari concept. Pictures of the car have circulated online, yet this was the fist auto show appearance for the sedan that represents the brand's new design language. Traditional Mazda design elements will be retained, such as the five-point grille and the prominent front fender shape, but the four-door Shinari embodies a new dynamic that blends sharp character lines with sculpted body shapes to convey a sense of power and elegance. Crisp character lines, sculpted body panels, and a pronounced cab rearward proportion give the Shinari a powerful appearance. The attention to detail is remarkable for a show car. The satin-finish metal trim that frames the bottom of the grille splays out through the headlamp openings. This strip seems to travel through the wheel arch and re-emerges as a side vent accent. Elements of this new design might soon appear on passenger sedans like the Mazda6, as well as replacements for sporty models like the MX-5 Miata and RX-8. 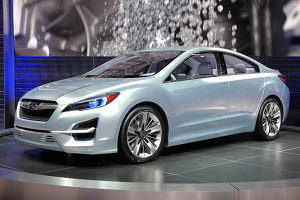 The Subaru Impreza Design Concept is an aggressive, but familiar, outlook for the all-wheel-drive-all-the-time company. Gone are the days of the three-box Subaru, as the overall line from the front of the car, through the bottom of the A-pillar, the roof, through the C-pillar and ultimately the trunk, is smooth and continuous. The front end -- with all the character lines, headlights, fog lights and air openings -- is much sharper and more pronounced than before. For a company that has sometimes struggled to find its own look, the Impreza Design Concept is a safe step towards a more lasting long-term impression. The engine is a 2-liter version of Subaru's trademark Boxer configuration flat-four motor. It's mated to a continuously variable transmission that Subaru calls Lineartronic. The EyeSight system is a clever tech touch, comprised of a series of cameras located at the front of the roof. EyeSight provides for collision mitigation, and can display the feed that it sees through the in-dash video system. The cabin is filled with video panels, including one located on the lower spoke of the steering wheel. Why wait on focus months or days to delve into our history and celebrate the achievements of those from the African Diaspora? Yardflex caught onto the fact that Dr. Mark Dean, who most of you have never heard of, was not recognised for his achievements at a recent IBM 20th anniversary celebration; when in fact this African American helped to initiate a digital revolution. Having more than 30 patents pending, Dr Dean is not only a Vice President with IBM, he also is the architect of the modern-day personal computer. As the holder of three of the original nine patents on the computer that all PCs are based on, Dr Dean is featured in the National Hall of Inventors. In fact his ingenuity helped to start an era that created people like Bill Gates and Dell Computer's Michael Dell; millions of jobs in information technology can be traced back to him. So what is the reason that his praises are not sufficiently lauded you ask, when in fact Dr Dean helped to shape the landscape of our society.? It is the consequence of a systemic poison known too well to "African Westerners" who are still denied substantial and meaningful representation in mass media. Not the first to be treated like a mere footnote, Dr. Dean joins the ranks of other prestigious African American inventors who have been blatantly overlooked. John Stanard, inventor of the refrigerator, George Sampson, creator of the clothes dryer, Alexander Miles brought us the elevator and Lewis Latimer – the electric lamp. None of these great inventors should be allowed to go quietly unnoticed. They are important and serve as great inspirations for particularly African American youth. Continue reading High Tech "Invisible" African American.